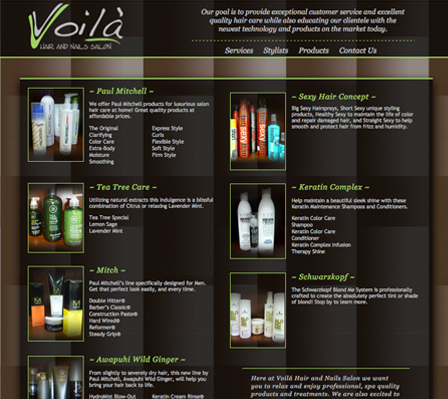 Content Managed Website developed for Voilà Hair and Nails Salon. 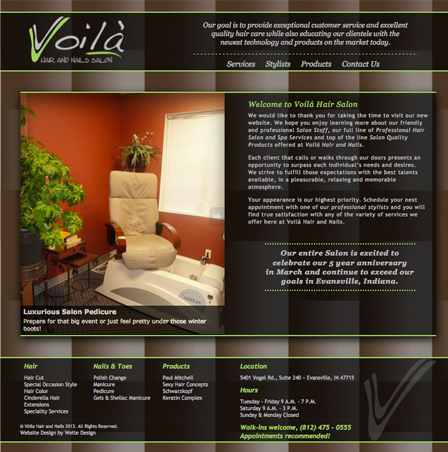 This Evansville salon website portrays the same warm chic feeling represented inside their front doors. Angie, the salon owner, put so much work into creating her salons inviting atmosphere I wanted to make certain it came through on the website. Warm, welcoming, friendly or just a place to enjoy the company of friends, are all accurate descriptions of Voilà Hair and Nails Salon. 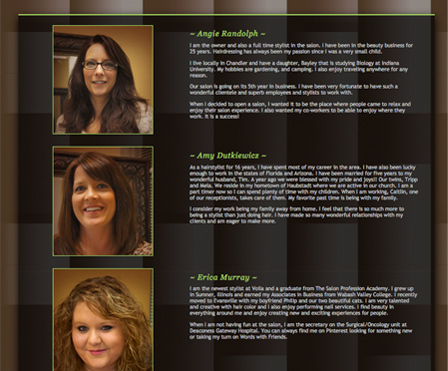 The same needed to be conveyed when opening this Evansville salon website. Angie already established a vibrant fun logo, featuring an energetic green before developing her salon website. I loved the idea of using this shade of green as an accent. I utilized warm shades of brown to lay a welcoming background for the content and incorporated an overlay of black to showcase this green. This also makes a subtle reference to her other branding without over powering the design. We definitely wanted to let all potential clients know the products her salon offered without having each bottle featured in an e-commerce fashion. So, featuring them in small groups allows everyone to see the product lines available without becoming overwhelming. This also allowed us to use the product headlines as links to each manufacturing salon website, further validating the site in search engines and helping with Search Engine Optimization ranking. Welcome! I think this is my favorite page on this salon website. Go Check it out for a fun personalized description of the stylists and their backgrounds!